Donald Sterling apparently went Donald Sterling the other day in an argument with his girlfriend, and TMZ published what it says is an audio recording of the conversation. So now there's more proof Donald Sterling can ruin anything, even the promising start to the NBA playoffs for his historically bad franchise. 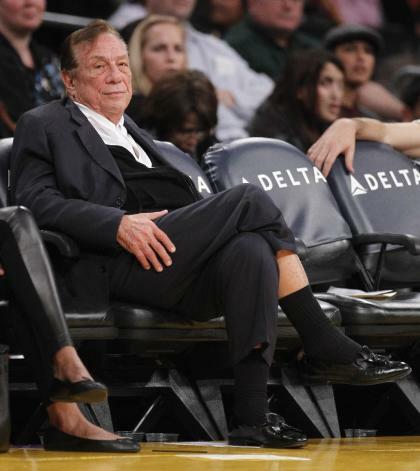 The Los Angeles Clippers owner, according to TMZ, is heard on tape making any number of racist comments. The NBA said Saturday it is conducting a "full investigation" into TMZ's recording and called the published comments "disturbing and offensive." Of course, those comments also should come as no surprise to anyone, least of all the NBA, Sterling's fellow owners or the NBA players' union that for years sat around and watched him repeatedly get hammered by the legal system over charges he discriminated in the rental of apartments he owns with his wife in Southern California. This is the worst owner in professional sports and naming the runner-up would be an insult to that guy. In this case, Sterling offered a laundry list of ridiculous sound bites, the lowlights center on admonishing his girlfriend, who is a minority, for using social media to show that she hangs around other minorities, particularly at Clipper games. • "I'm just saying, in your lousy [expletive] Instagrams, you don't have to have yourself with, walking with black people." The entire thing is equal parts pathetic, despicable and ridiculous. It's also Donald Sterling unplugged. In fairness, he sounds old and tired and maybe even a little bit baited by his girlfriend. Then again, there might be more sympathy for a guy getting secretly taped if it wasn't for a checkered past that is far, far worse than these comments. This is proof that in our current media environment anything on tape (video or audio) generates reactions far greater than anything not on tape. Sterling here proves himself a sad, sorry old man. What his decades of legal battles with the government showed was far worse, though, and why someone in basketball should've at least attempted to publicly set him straight, if only for their own image. The NBA has an admirable history of tolerance, inclusion and progressive hiring even in positions of power. It includes players, coaches, executives, owners and fans from around the globe. Yet with Sterling, there was little protest. In 2009, Sterling agreed to pay the U.S. Justice Department a then-record $2.73 million to settle allegations his companies targeted and discriminated against blacks, Hispanics and families with children in renting apartments in greater Los Angeles. In 2005, his company agreed to settle a similar racial discrimination suit for an undisclosed sum – "one of the largest ever obtained in this type of case," according to the judge – and a reported $5 million in plaintiff legal fees. He's been sued multiple times by individuals on racial charges. The tape is just the latest in a near endless list of terrible comments people have relayed, often on the record, through the courts or media. In 2011, a jury rejected a wrongful termination suit brought by longtime general manager Elgin Baylor, but it did contain Baylor's allegation, which had nothing to do with the case, that Sterling tried to control the race of his tenants because, he allegedly said, "Black tenants smell and attract vermin." Sterling's legal team always countered that he settled the suits where the cost of litigation exceeded the payouts, which means Donald Sterling is so cheap he won't even spend money to defend his reputation against being a terrible racist. And Clippers fans thought it was only about basketball. You'd think a rich (and innocent) man would go to the end to clear his name on such brutal charges, but really what name is there to clear? Say this about him: He's equal opportunity. He's been accused of discriminating against blacks, Hispanics and Koreans, both the poor and powerless, and now someone as rich and famous as Magic Johnson. The taped words on a continuous media loop pale in importance to his actions through the years. A private conversation with a possibly vengeful girlfriend – she's a real gem herself; Sterling's wife is reportedly suing her to recoup some of the property and cash given to her by Sterling – is almost unimportant. No one other than Sterling was actually harmed by those words. The housing discrimination is completely different, a real-world bit of awfulness that is one of the invisible hands in society that negatively impact innocent and hard-working people, families and children. It simply can't be tolerated. His companies controlled huge swaths of homes and apartments in Southern California, and these kinds of actions are what both directly and indirectly force minority families to stay in dangerous, blighted neighborhoods with poor school districts and limited opportunities. It's the kind of acts that run counter to everything America is supposed to be about. How many NBA players dealt with something like that growing up? If there was ever an issue that should strike a chord of protest, this was – and still is – it. Yet Sterling always continued on, the league office mute even under commissioner David Stern, who himself once worked as a lawyer fighting housing discrimination in New Jersey. Publicly, the other owners looked the other way, perhaps because his team was always easy to beat under his frugal mismanagement. Well, now Donald Sterling is apparently talking again. Don't bring black people to the games, he's saying. Don't walk with them. Don't broadcast. Now new NBA commissioner Adam Silver gets his first test, truly earns his first check as he navigates this – dealing with an owner caught in an ugly scandal. The NBA says it is investigating, and we'll see where it goes from here. This has been a long time coming. In the interim, it's easy to say every right-thinking fan of any race (the ones Sterling apparently likes or doesn't) should stay away from Staples Center until Sterling himself is gone or offers some kind of reasonable solution. Except, that isn't fair to the fans of the Clippers who have waited forever for a winner, and now have one – at the same time as the Lakers stink. Nor would it really help to "suspend" Sterling and let him sit in his mansion somewhere, growing more embittered and cursing society for not seeing things his way. Maybe it would be best to have everyone show up for Tuesday's Game 5 against Golden State, Sterling included, and let him hear from the fans directly. Black, white, whatever. Let the public give him the loud scolding the NBA, its players and other owners never would. Then let them broadcast that on social media.